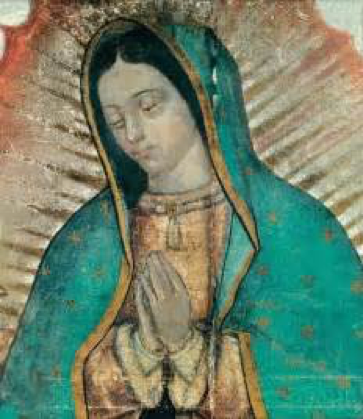 St. Juan Diego, a humble Aztec peasant, saw the Blessed Virgin Mary on the Hill of Tepeyac near present-day Mexico City on December 9, 1531, the feast of the Immaculate Conception in the Spanish Empire at the time. This apparition became known as Our Lady of Guadalupe. After a request by the bishop to prove her identity, Our Lady asked Juan Diego to gather the roses which he found growing on the hill, which were neither native to the area nor in season, and take them to the bishop. Juan Diego did so and placed the roses in his tilma (or cloak). Upon opening the tilma to reveal the miraculous roses to the bishop, there was something even more miraculous present—an image of the Virgin Mary dressed as a pregnant Aztec princess. In the image Our Lady wears traditional Aztec garments of royalty and a black sash around her waist, which indicated pregnancy in the Aztec culture to which she was revealed. The various design elements on the tilma read like a codex to the Aztecs, revealing to them the truth of the Catholic faith preached by the missionary priests. A mass conversion of millions of Aztecs to the Christian faith soon followed, ending the human sacrifices, especially child sacrifices that they practiced. A church was built on the Hill of Tepeyac to mark the apparition site and today it is one of the most famous Catholic pilgrimage sites in the world. In this cathedral on display is the original tilma of Juan Diego that still displays the miraculous Our Lady of Guadalupe image. The image has been subjected to scientific testing to prove its miraculous authenticity. This apparition and image is venerated under the title of Our Lady of Guadalupe, the first Marian apparition in the New World, and the only one where Our Lady produced an image of herself. The perfectly preserved tilma is venerated at her basilica and shrine in Mexico City. Our Lady of Guadalupe is the patroness of the Americas, the New Evangelization, pregnant women and unborn children. Her feast day is December 12th. The Guadalupe apparitions are unlike any other apparition of the Blessed Virgin. and Christ Child image in which Our Lady is pregnant instead of holding the Infant Jesus.